Cuireann an cluiche go mór le stór focail foghlamóirí agus beidh spórt agus spraoi ag gaeilgeoirí líofa leis an chluiche chomh maith. 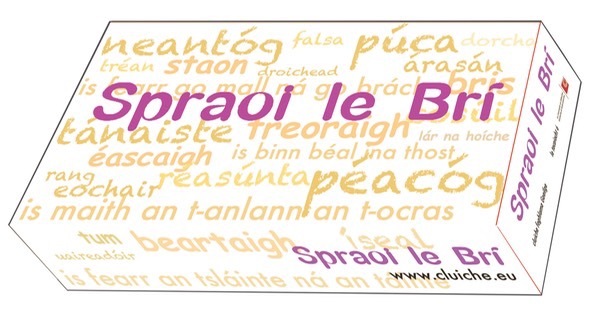 Spraoi le Brí is a game with six packs of card and a dice to determine which pack will be used on each turn. This game is for 2 or more players. Pack 1, contains cards with three nouns on each; Pack 2 has three adjectives on each card; Pack 3 has verbs, Pack 4 has phrases in the genetive case and Pack 5 has proverbs. For each of these five pack the object is for the player to explain the words without using the words themselves, to the other players - its like Charades in reverse. The more soimilar words a player can think of the easier it will be for the team mates to guess the word or proverb. Pack 6 contains themes, and the player must call out words associated with 5 themes on the card: for example 5 things you’d find in a fridge, 4 things you’d see in a post office, three types of pasta, two animals in a zoo and one river in County Cork… all as Gaeilge, and all helping to extend the vocabulary of the players.